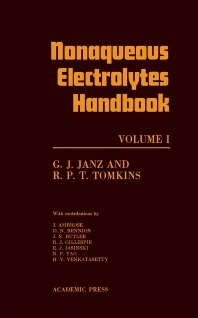 Nonaqueous Electrolytes Handbook, Volume I, is an authoritative and updated information source for nonaqueous solvent systems. The information in this handbook covers the literature to 1972 and includes data for some 210 solvents. The book has been organized into eight well-defined areas: Physical Properties o f Solvents, Solvent Purification, Electrical Conductance, Diffusion, Density, Viscosity, Transference Numbers, and Additional References and Data Sources. The latter section covers additional data sources and reviews not adequately described in the preceding sections; recent data and references are also found in this section. The method of presentation of material is briefly described in the introduction to each section to facilitate the use of the tabulated information. Bibliographies are given at the end of each section. A Compound Index is included. Electrical conductance is the property most widely investigated. In view of the wealth of data, this section has been organized by solutes as follows: acids and alkali metal compounds, including ammonium compounds; quaternary ammonium salts and amines; solvent systems, electrolyte systems, and finally, all other solutes. For each, the data are reported not only for single component nonaqueous solvents but also for mixed solvents.